When you are injured because of a defective or dangerous product, you may have a products liability claim. While you might think your claim falls under one simple category, the fact is that defective product liability claims are broken down even further. Defective design means that the product’s design is inherently defective. This type of liability claim tends to encompass an entire line of products like flammable children’s pajamas or an automobile that is unusually prone to rolling over or a drug that is recalled because it is found to cause cancer. In order to fall under this category, your injury must have been caused by the defective design. 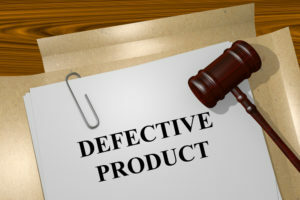 A claim based on defective manufacture means the product was not built as designed but rather, is flawed due to a manufacturing error while it was being made. An example of this could be a motorcycle with its brake pads not properly attached. If you were trying to stop behind a car at a red light but instead crashed into it due to your new motorcycle’s improperly attached brake pads, that would be an example of a manufacturing defect that causes your accident. The final type of defective product liability claim is based on inadequate warnings or instructions. This usually means the product is dangerous in some way that is not obvious to users. One example of this could be an over-the-counter drug that does not warn the consumer about the dangers associated with mixing it with another commonly used drug. Another example is a chemical that is damaging to the skin but is sold without a warning explaining the need to wear special protective gloves when using the product. It is not always obvious as to which category your defective product liability claim belongs. That is why it is important to consult an experienced product liability lawyer. In New Jersey, the lawyers at Team Law have extensive experience defending consumers from defective products. They will put their 60 years of experience toward holding the correct party accountable for your injury or damages. Contact us today at 732-388-5454 to schedule a free consultation.